The tragic story of the complex bond between migrant laborers in Central California. They are George Milton and Lennie Small, itinerant ranch hands who dream of one day owning a small farm. 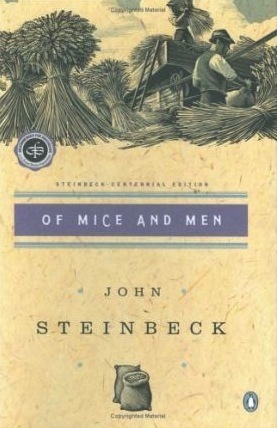 George acts as a father figure to Lennie, who is a very large, simple-minded man, calming him and helping to rein in his immense physical strength. A classic! I read a classic! Not one I had anticipated reading this year, but by golly I read it just the same. Okay. It was kind of assigned reading. I had to step in for someone for a staff-led book club and thank goodness this was a short one. I'm not sure how I managed to make it through18.5 years of school without ever having read this extremely tragic tale. Better late than never I suppose. I was, of course, familiar with the story before picking up the book.I've never seen the movie, but it's been parodied enough in pop culture that I knew what was coming. It doesn't make it any less heartbreaking at the end. And not just because of George's hard choice. It's heartbreaking in its loneliness and the loss of dreams. What impressed me most is the completeness of a story in only one-hundred pages. It didn't rush. It was just...concise I suppose. There was backstory, there was character development, there was scene setting, and there was plot. It was all there and revealed in a timely manner. And it didn't read like a short story. I never felt like I had been dropped into the middle of the plot. I was starting a new beginning with George and Lennie, and I saw it through to the tragic end. So yeah. I read a classic, and I'm really glad it was for a book club because the discussion really helped me fully appreciate the time and setting in which the story took place.